Summary: They complement each other wonderfully, and they make this journey one that’s both memorable and very enjoyable. There’s a scene towards the end of Away We Go in which a character is given a moment to state his philosophy of life. He’s got a plate of pancakes in front of him, so he builds a little house with the pancakes, saying that this is what life is; the little house you’ve made. Then he pours syrup all over it to stick it all together. The syrup is love, you see? Love is what makes life work, he says, it keeps it all stuck together. It’s a moment that steps right up to the dividing line between meaningful sentiment and unbearable cheese, but thanks to the performance of the actor in question (Chris Messina), it hits just the right note of emotional sincerity. Away We Go is a film that, from scene to scene, lives or dies on the strengths and weaknesses of its actors’ performances. This is unexpected, as it’s directed by Sam Mendes, an Oscar winner whose previous films have all fairly hummed with an air of precision in every aspect, clearly identifiable as products of the man behind the camera. There’s a definite relaxing of grip from Mendes here, and while this results in a few scenes that would have been better on the cutting room floor, the film has a warmth and vitality that is new for the man who gave us American Beauty and Revolutionary Road. 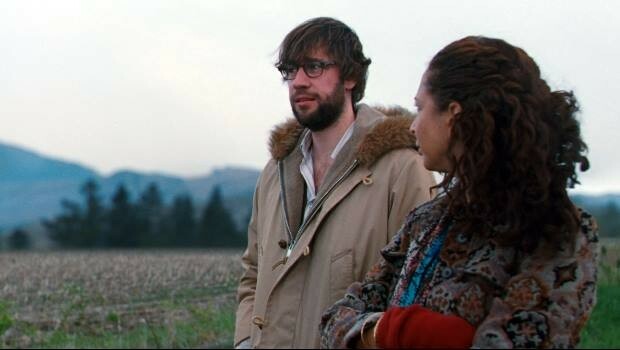 Away We Go is a lighter and more hopeful film than anything else Mendes has made, and this is largely down to its two stars, American TV regulars John Krasinski and Maya Rudolph. They play Burt and Verona, a young couple who are expecting their first child. After receiving the unexpected news that Burt’s parents are moving away from the small town they all live in, the pair decide to look for a new place to start their family. Thus writers Dave Eggers and Vendela Vida have a perfect pretext to send the intrepid pair on a road-trip, dropping them in on various friends and relatives in different parts of the US and Canada. Through these encounters, Burt and Verona are exposed to wildly differing perspectives on parenting and families – including the one detailed above – and ultimately come to a place of peace about the direction that their own family life is taking. The supporting cast that populate Burt and Verona’s journey vary greatly in quality and effectiveness; Allison Janney is hilarious as the most tactless parent ever, but Maggie Gyllenhaal’s ‘earth mother’ is too broad and obvious – her portrayal is not so much a caricature as a character assassination. But Krasinski and Rudolph are the ones we’re supposed to really care about, and they make it easy for us. Both actors give genuinely loveable performances, and effortlessly convince as a couple who can claim “no-one’s in love like us”. Krasinski, who was excellent in George Clooney’s underrated comedy Leatherheads, is funny and warm, even managing to make his character’s obsession with breasts seem quirky rather than sleazy, while Rudolph has a beautifully expressive face, allowing her to convey great feeling with the subtlest of glances. They complement each other wonderfully, and they make this journey one that’s both memorable and very enjoyable.